WeCommerce - Template Blog SEO Fast Loading untuk Toko Online. Simple & Responsive (Mobile Friendly). Gratis Free Download! JIKA Anda hendak membuat blog online store, online shopping, e-commerce, alias toko online menggunakan platform blog blogspot, maka WeCommerce ini menjadi alternatif template yang digunakan. Tampilannya simple, SEO Optimized, dan Responsive. Dengan menggunakan template ini, Anda dengan mudah mulai membangun toko online Anda dengan domain di blogger (custom domain) atau free subdomain (.blogspot.com). 100% Pure Responsive: WeCommerce is 100% responsive and mobile friendly blogger template which makes user experience smooth enough on handheld devices. Search Engine Optimized: WeCommerce is targeted for Search Engines like Google to provide you best ranking in search results. Easy Control Customization: WeCommerce comes with fully written documentation which tells how you can setup the template to receive payments directly to your paypal account and even redirect users to a new location. More Features: Inbuilt slider, awesome post configuration, comments turned into reviews, etc. 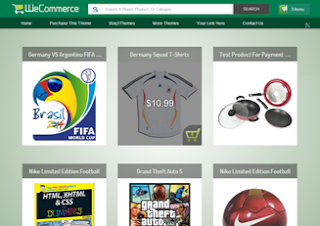 0 Komentar untuk "WeCommerce - Template Toko Online Simple & Responsive "